Do Your K-9 Officers Have the Right Equipment? Law enforcement officers have been using dogs in an official capacity since at least the 1850s. K-9 officers and their equipment have come a long way since then. Which canine equipment is imperative for the safety of your animal – and your colleagues – when in the field? Vel Tye develops cutting-edge tactical gear for humans and dogs. Our canine protection vests are used by law enforcement agencies throughout the country. Here’s what to know about equipping your canine force. Canines are used for a variety of purposes and thus require different equipment. A single-purpose narcotics dog, for example, will need far less equipment than a dual-purpose tracking and detection dog. Consider all the factors before purchasing gear. It’s also a good idea to consult with the dog’s trainer when possible. A selection of collars that may include a leather collar, electric collar, training collar, etc. All police dogs must undergo continuous training while working in the field. Along with occasional intensive training sessions, at least one officer should be designated to perform weekly training sessions with the animal. Most precincts with a K-9 unit ultimately decide to keep a store of training equipment on-hand including bite sleeves, protection sticks, and even muzzle vests. Canine officers deserve to be as well-outfitted as their human counterparts. Their gear – particularly any protection gear – should be designed with comfort in mind; dogs need to be comfortable to perform at their best. After all, some of the biggest value-adds of a K-9 companion are the dog’s agility and speed. Vel Tye produces high quality tactical gear right here in the U.S.A. Our K-9 tactical vest is the only one on the market that protects a dog’s vulnerable abdominal area from blades and other threats. 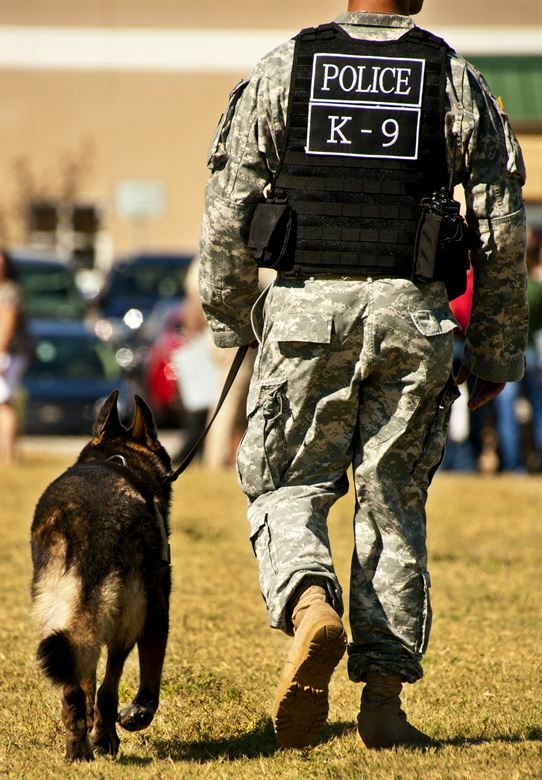 For the ultimate fit, all of our K-9 protection vests are custom made to your dog’s exact specifications. Reach out to the Vel Tye team today.